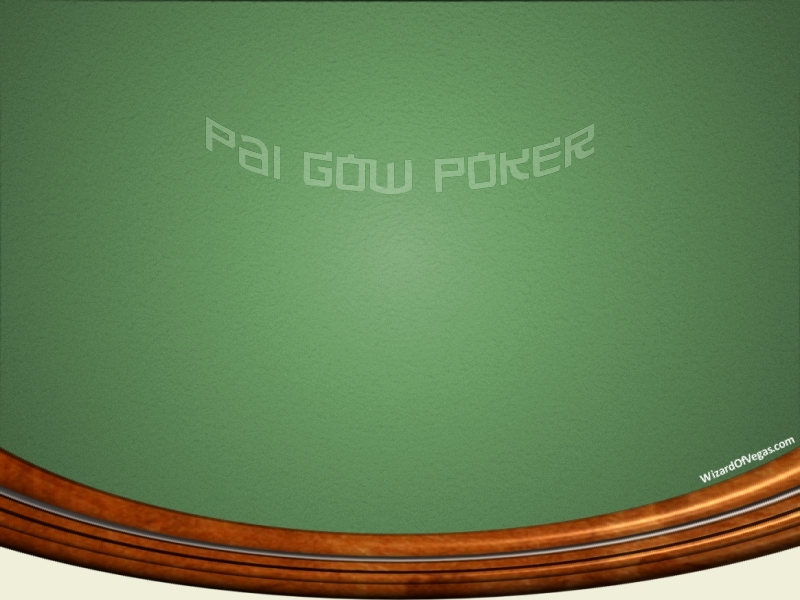 Pai Gow Poker is a game that uses a 53-card deck. In addition to the standard cards, there is a joker. While a joker would be wild and replace any card in most poker games, it has narrow uses in Pai Gow Poker. A joker may only replace a card missing from a straight flush, flush, or straight. Otherwise, it is simply an ace. The first step in Pai Gow Poker is to place a wager on the hand. Land-based casinos will offer at least one jackpot wager. Our game keeps it simple with just a traditional bet. The player and the banker are both dealt seven cards. These cards must be set into two hands. There is a five-card and a two-card hand. The five-card hand is often referred to as the high or back hand, while the two-card hand is called the low or front hand. The five-card hand must be better than the two-card hand. An easier way to think of this is that the five cards are the best and the two cards are the second best. The two-card hand is either a pair or a high card. There are no straights or flushes in this hand. If there is no pair or better in the five-card hand, the two-card hand may not have a pair. It is important to set a hand properly. If the low hand beats the high hand, it will automatically lose. Once the player sets his hand, it is compared to the banker's hand. The player must win both the front and back hand to win. If one hand wins, while the other loses, the hand is a push. The banker wins all ties, which are called a copy. If one of the player's hands wins while the other copies, the hand is a push. If one of the player's hands loses and the other ties, the banker wins. All players at the table are against the banker. They do not play each other. The house takes 5% commission on all winnings. A live Pai Gow Poker table will often have quarters of half dollars on the table to cover the commission on wagers that are not divisible by $20. Pai Gow Poker is an unusual game as it allows players to bank. The policy on player banking varies from one house to another. Some will allow a player to bank every other hand. Others require there to be two hands banked by the house before allowing the next player to bank. Some casinos will move the banker button around the table, even if nobody is seated there. Our game allows players to bank every other hand. This may be toggled by unchecking the box at the top of the app. There are advantages to banking. The hands that copy will go to the player if he is banking. This can change the result of a hand from a loss to a push or push to the win. The house takes a 5% commission on all banker wins, just as it does on player hands. Players that bank in a casino will be required to cover all action at the table. The player banker will pay all wins and losses from his chips. The house will take 5% of the net win from a hand banked by a player. The basic strategy may be found on the Pai Gow Poker page at Wizard of Odds (LINK). Our game will warn players of an error by default. Clicking OK will set the hand incorrectly as chosen by the player, while choosing cancel will allow the hand to be set again. Our practice game will not allow the two-card hand to be set improperly where it is higher than the five-card hand. In a casino, a hand set incorrectly in this way automatically loses, although you may find a pit boss that will let it slide one time during a session.